Would you like to discover the marketing secrets from the team that grew Beachbody from $100 million to more than $1 billion in revenue? Babak Azad was a leader within the marketing team that helped launch Beachbody into an iconic brand within the fitness industry. Today, Babak Azad is the founder and CEO of Round Two Partners which works with other brands and subscription companies to help them do the same. I recently caught up with him for an interview for my podcast, Membership and Subscription Growth. While Babak and I discussed several breakthroughs on the podcast, here are two that can have an immediate impact on your subscription revenue growth. Your subscription product is more than a simple transaction and needs to be treated differently. Rather than selling that product, you need to be selling results. The results that your customers are going to personally experience by using or receiving your product are where the focus of your sales message should be. Your customers don’t care about what you’re going to deliver, they only care about how it’s going to improve their lives or help them. Few subscription businesses are spending enough time looking at their numbers. Running your subscription business without proper KPI’s is similar to taking your family on a road trip without seeing where you are going, having a speedometer or a compass. KPI’s are like having GPS navigation for your subscription revenue growth. They tell you exactly what to do for fastest growth. Babak suggests you start with recording the lifespan of your subscribers’ activity. Measure how long your customers stay with you. How many billing cycles do they stay through before you lose them? Tracking this activity of each subscriber will reveal trends and opportunities to make changes to the subscription cycle at the point where you seem to be losing them. This data also helps you determine where to focus your time, staff functions, and dollars to promote growth. “You don’t need a statistical tool. You need Excel and a data dump, and you will at least start to get there. Then undoubtedly, it raises questions and there are things that will start to trickle up. You at least have a baseline. If that means that you don’t even go and backfill for 2016 and 2015, fine. Just start with where you are. Then, you’ve got to create a bit of a process that every month or two months, whatever it is, you update it and then you are trying to test and optimize, to improve those metrics,” adds Babak. Whether you are starting your subscription business or years deep in it, it is never too late to implement these practices of making your marketing message about your product’s results and then measuring the activity of your subscribers to find growth opportunities. 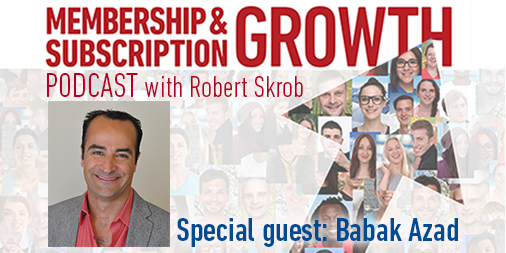 You can discover more from the full interview with Babak Azad on the Membership and Subscription Growth podcast. Subscribe to the podcast to discover the keys to recurring revenue growth from successful entrepreneurs in the subscription economy. Previous and upcoming guests include Robbie Kellman Baxter (author of The Membership Economy), Amir Elaguizy (CEO of CrateJoy), Dustin McAdams (CEO of PupJoy), Perry Marshall (Founder of Perry Marshall & Associates), Liz Cadman (Founder of MySubscriptionAddiction.com), Deena Bronz (Co-founder and CEO of KitNipBox), Tim Broom (Founder of ITProTV), and Georg Richter (Founder of OceanX)!